My speedo trip cable snapped some time ago, I tried to get the remains of the cable out so that I could replace it with the BMW one that fits but I can’t remove the remaining bit of cable. Not having a trip is becoming a real pain in the arse. What good options for speedo replacement are out there? Ideally I would like it to fit nicely in the dash cut out. I don’t have big bucks for an all singing and dancing GPS one. Which speedo do you have plastic or metal body? Did you remove the tiny pin hlding the cable in? I ground an old valve down very thin to punch it out, same with the adjuster knob. I made the cable from some old british speedo cable inner. This is thicker, I squared it and ground it down to fit. Cheers for the responses gents. It is the plastic bodied type, I’ve been trying to remove the tiny pin but haven’t been able to get it to budge as of yet. 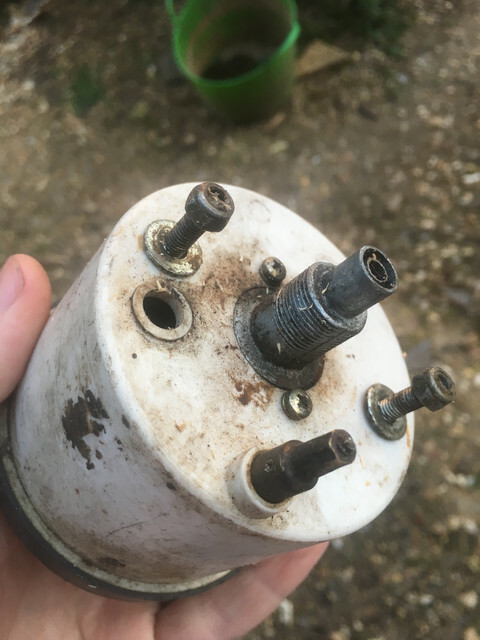 I've had the same problem I managed to remove the role pin using a watch pin removal tool if you get stuck pop in the post and I'll have a go at getting it out. Cheers Dave. I’ve got a watch pin tool for a couple of quid on its way so will give that a go. I have a prototype replacement Speedo that fits in the dash on a 350 probably do a 500 as well but I'm always busy with engines and now wiring looms to finish this little project off. If any one wants to pop in with their MT is useful with spanners etc and do the fettling I can then get the kit and instructions added to the webshop.. I managed to finally get the pin out. Will try the remains of the broken cable tomorrow but shouldn’t be too difficult. BMW F650 cable I think fits doesn’t it? The F650 unit looks very similar in appearance. Any one measured it up for size?